Erwin Knippenberg is a guest blogger for Brighter Green. Brighter Green sometimes features updates on agricultural changes, particularly the global South. Sam Binda is a farmer like his father and his father before him. He grows okra, African eggplant and other vegetables to feed his family and sells whatever is left at his local market. As a member of CHAP ‘a community based farming organization’he pools his efforts with his neighbors, sharing tools and know-how. Sam is a Liberian, working to rebuild his country after a brutal 14-year civil war. A little over a year ago, a local for-profit venture called Grain Coast Inc. started working with Sam and CHAP to promote organic farming, using home-made fertilizers and pesticides. Founded by Bill Tolbert, a Liberian who’d lived in the U.S. for many years, Grain Coast provides tools and training, working with farmers like Sam to increase yields and then buying the surplus produce. Through a Consumer Supported Agriculture (CSA) model, Liberia’s first, customers buy a subscription, which guarantees them a weekly delivery of fresh vegetables. As in CSAs in the U.S., Europe, and Japan, the contents of the box vary with the harvest and the season, but a tropical climate ensures that it stays full fifty two weeks a year. Despite the challenges of operating in a post-war country, the Liberian owned venture manages to break even, ensuring its sustainability. But wait, isn’t “organic” a “niche” product, aimed at mostly wealthy customers in developing countries? How will organics help feed an additional 2 billion people by 2050, which will require what many researches say is an estimated 70 percent increase in food production? Although agribusiness may insist that factory-farming and GMO’s are the only way, in many countries most food is produced by small-holders using little to no chemical fertilizers or pesticides. Recent spikes in food prices (some linked to the Arab Spring) have led to a renewed interest in boosting agricultural production. Money from public and private investors, including the Gates Foundation has come flooding in. Unfortunately, the result is too often a “land grab”, where small farmers lose out to multinational agribusinesses like Monsanto and Cargill. According to a World Bank report, to date agribusiness companies have sought to acquire 56 million hectares of land globally, more than half (29 million) in Africa, an area roughly the size of the state of Arizona. Farmers lose their land, while the mechanized, mono-cropping techniques introduced destroy the soils and render local populations even more vulnerable to a changing climate. There is another way. Firms like Grain Coast work to promote organic farming among subsistence farmers. Conscious of the many barriers to accessing markets the farmers face, the firm offers a package deal. It provides tools and training to the farmers on credit. This includes natural pesticides containing self-perpetuating microorganisms, so the farmer can continue making their own. Produce takes six to eight weeks to grow in Liberia’s lush climate. Normally the farmers then face an uphill battle to transport the crops to market and sell them. Up to half the crop is lost in transit, and they have to sell the rest on the cheap before it goes bad (food waste, in both industrialized and global South countries, is a huge problem). To avoid this scenario in Liberia, Grain Coast buys the farmers’ crop and processes and packages it for sale in Monrovia and abroad. A portion of the proceeds goes to pay back the initial credit, and within a year most farmers are debt free and making two to three times as much in sales as they were before. In its first year of operation, GrainCoast maintained a base of fifty customers and yielded gross income of 33,000 U.S. dollars. 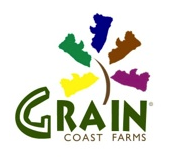 In 2014, Grain Coast expects to expand the CSA subscribers to 100, with sales of more than 60,000 U.S. dollars. But Grain Coast isn’t stopping there. Founder Bill Tolbert recently launched an international crowd funding campaign to finance a starter kit for co-ops, drill wells and to build a processing facility. -Supply a large volume of fresh okra to a European supermarket chain. Our buyer is willing to work hand-in-hand with us to ensure quality and on-time delivery. -Use an out-grower scheme to fulfill this order and follow-on orders. -Target fifteen smallholder farmers and two community-based farming organizations in the first year. Bill also plans to diversify into rice, using the SRI techniques developed by researchers to end Liberians dependence on imported food. “I want to inspire entrepreneurs to transform agriculture in Africa!” he says. I suggest: stay tuned.